Several hours ahead: In saucepan, place raisins and cranberries and water; soak for 20 minutes. Meanwhile wash and pick over cranberries. Add cranberries and sugar to the raisins and cook, covered, until skins burst (about 10 minutes). Cool. Start heating oven to 425 Degrees F. Roll out bottom crust of pie; fit into pie plate, set aside. Roll out top crust, cut into 1/2 inch strips for lattice top. Fill lined pie plate with cooked cranberry filling; on top arrange strips to make lattice top. Flute edges. Bake 30 minutes, or until crust is well brown. Serve slightly warm. To Flame: Dot several open spaces with sugar cubes dipped in lemon extract; light with match. Serve at once as is or with vanilla icecream . Blend all ingredients. Mixture will be lumpy. Pour into a greased loaf pan. Bake in a pre-heated 350 oven for 1 hour, 15 minutes, or until lightly browned on top. Pour boiling water over tea bags in teapot; cover and steep 5 minutes. Remove tea bags. Stir in sugar; cool. In large pitcher, combine tea with cranberry-juice cocktail and lemon juice. Serve with ice. In small saucepan, place orange juice and heat over medium heat. Add cranberries, cover and set aside to soften. In another saucepan, place 2 tb of the margarine and melt over medium heat. Add celery and onion and saute about 2 minutes. To 1/3 c of the stuffing mix, add sage; stir into celery-onion mixture and add 2/3 c of the cranberries. Sprinkle chicken with pepper and spread with mustard. Spoon cranberry mixture in center of each piece, roll chicken over filling and fasten with wooden picks. Melt remaining 3 tb margarine and dip each chicken roll, first in margarine and then in remaining 2/3 c crushed stuffing. Place chicken on baking pan lined with foil and sprayed with a vegetable spray. Bake, uncovered, in 350~ oven about 30 minutes or until fork can be inserted in chicken with ease. Garnish with tomato rosettes and parsley; sprinkle chicken with remaining 2 tb cranberries. Sprinkle chops on both sides with onion powder; set aside. In a medium-size saucepan, heat cranberry sauce, brown sugar, 2 tablespoons water, ginger and nutmeg until cranberry sauce is melted, about 2 minutes. Place carrots in a 2 1/2-quart casserole; arrange pork chops over carrots. Spoon cranberry sauce mixture evenly over pork chops. Cover and bake in preheated 375 degrees F. oven until pork is thoroughly cooked, about 45 minutes. Remove chops to a serving plate; scatter carrots over chops. Pour sauce remaining in casserole into a medium-size saucepan. Combine cornstarch with remaining 1 tablespoon water; stir into saucepan and cook, stirring, until sauce is clear and thickened, about 2 minutes. Spoon over pork chops; sprinkle with parsley flakes. Fry the bacon in its own fat until browned. Add the onion and a splash of oil if needed, cook until softened and add the remaining ingredients, mix everything together and season well . Cool before using . Chill until needed. Add ingredients in the order suggested by the bread machine manufacturer and follow instructions provided in the manual. In a bowl, combine cranberry sauce, salad dressing and soup mix. Rinse chicken; pat dry with paper towels. Remove and discard skin, if desired. Arrange pieces in one layer in a 13x9x2-inch baking dish. Pour cranberry mixture over chicken pieces. Cover and chill the chicken mixture in the refrigerator for several hours or overnight. Bake the chicken mixture, uncovered, in a 300F oven about 1 1/2 hours or till the chicken is done, stirring glaze and spooning over chicken once or twice. Serve the chicken and glaze on a platter with hot, coooked rice, if desired. Garnish the chicken with fresh rosemary, if desired. Beat butter and brown sugar in large bowl until creamy; beat in flour, oats and orange peel until crumbly. Stir in chocolate chips and cranberries; reserve 2 cups mixture. Press remaining mixture onto bottom of greased 13-by-9-inch baking pan. Bake at 350 degrees 15 minutes. Beat cream cheese in small bowl until smooth. Gradually beat in sweetened condensed milk. Pour over hot crust; sprinkle with reserved oat mixture. Return to oven and bake 25 to 30 minutes or until center is set. Cool in pan on wire rack. Makes about 3 dozen. In a large bowl, combine the cranberry sauce, tomato sauce, beans, mustard and onion. Place in a greased 13x9 inch baking dish. Lay bacon on top. Sprinkle with brown sugar. Bake at 350 for 1 hour. Makes 12-16 servings. Combine all ingredients except whipped cream. Pour into a shallow greased 1 1/2 quart baking dish. Bake in a preheated 350 degree oven 25 minutes, or until firm. Serve warm with cream or a dollop of whipped cream. Combine cranberries with sugar in small saucepan. Cook over medium heat 10 minutes or until berries have popped and mixture forms a sauce. Cool. Blend cranberry mixture into softened butter with wooden spoon. Pack into crocks or molds. Chill. Makes three cups. In small saucepan, over medium heat, cook and stir cranberry sauce, mustard and orange peel until blended and smooth; cool completely. Grill or broil chicken 6" from heat source for 25 to 30 minutes, turning occasionally and brushing with sauce during last 10 minutes. In a shallow dish, combine flour, salt and pepper; dredge chicken. In a skillet melt butter over Medium heat. Brown the chicken on both sides. Remove and keep warm. In the same skillet, add cranberries, water, brown sugar, nutmeg and vinegar, if desired. Cook and stir until the cranberries burst, about 5 minutes. Return chicken to skillet. Cover and simmer for 20-30 minutes or until chicken is tender, basting occasionally with the sauce. Serve over rice. Serves 4-6 servings. Grind cranberries, discard juice. Drain pineapple, combine with cranberries. Add marshmallows. Whip cream, adding sugar gradually. Fold whipped cream into cranberry mixture. Let set for 4 to 5 hours in refrigerator until marshmallows are firm and plump. Break up the cranberry sauce with a fork and beat with a rotary beater until all lumps are gone. Blend in lemon juice. Put in a refrigerator tray and freeze to a mush. Blend in the whipped cream and beat until smooth. Return to freezing tray and freeze. For added smoothness, remove and beat a second time before final freezing. In saucepan, combine all ingredients. Bring to a boil. Use to baste lamb or pork last 15 minutes of grilling. Meatballs should be relatively bland, since you want the sauce to star. Use a Swedish-style meatball or a teriyaki/Hawaiian meatball - they aren't as spicy as Italian or others. In a medium saucepan, combine the cranberry sauce, onion soup packet, and catalina dressing. Heat and whisk till well-combined. Add meatballs and simmer till heated through. Meatballs may be transferred to a chafing dish or a slow cooker for hot service. Makes 4 main-dish servings or 8 appetizer servings. 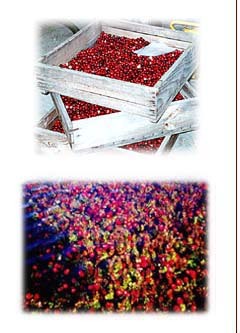 * Fresh or frozen cranberries can be used. Cut unpeeled orange into eighths. Place orange, cranberries and sugar in food processor or blender and grind. Refrigerate for several hours to blend flavors. Store covered in refrigerator. Beat cream cheese and sugar until creamy. Blend in milk and vanilla. Fold in Cool Whip and then cranberry sauce. Spoon into pie shell. Freeze. Serve. This can be refrozen. Grind the cranberries finely first and mix with sugar. Let set overnight in the refrigerator. Then combine the rest of the ingredients. Refrigerate. Combine all ingredients in a food processor. Be careful not to over-process. Pulse just until chopped. Chill. Yield: 8 servings. Cut peel and all white membrane from oranges. Grate or zest 4 Tbsp of the orange peel. Coarsely chop orange sections. Place into a sauce pan, bring to a boil, rediuce heat to low and simmer until thick, stirring is they the sauce does not burn. Wash the cranberries and pick out the bad ones. In an oven proof pan (9x13 is a good size) mix the cranberries, sugar, and brandy. Cook for 2 hours at 350. Can be served warm but I find that they're best when chilled. In a large stockpot, combine the orange juice, sugar, cranberries and zest. Bring to a boil, reduce heat to simmer and cook 10 minutes. Remove from heat. Stir in walnuts and let cool. Refrigerate overnight before serving. Cook cranberries in boiling water until skins are broken. Then ADD the remaining ingredients. Then CHILL in refrigerator. In a medium nonreactive saucepan, combine the cranberries and 3/4 cup water. Bring to a boil over moderate heat and boil, stirring occasionally, until the cranberries burst and the mixture reduces to 1-1/4 cups, about 12 minutes. Remove from the heat and stir in 1/3 cup of the sugar until dissolved. Strain the mixture through a coarse sieve and let the puree cool completely. Preheat the oven to 275 degrees. Butter and flour a 9-by-2-3/4-inch springform pan. In a large bowl, using an electric mixer, beat the cream cheese with the remaining 1 cup plus 2 tablespoons sugar and the vanilla at low speed until smooth. Beat in the eggs one at a time, beating until just blended. Stir in the sour cream. Spoon half of the cream cheese mixture into the prepared pan. Drop 8 or 9 rounded teaspoons of the cranberry puree randomly over the top. Spoon half of the remaining cheesecake mixture evenly over the first layer and dot with half of the remaining puree. Repeat with the remaining cheesecake mixture and puree. (Avoid dropping puree in the center of more than 1 layer.) With a blunt knife, cut through the batter in a swirling motion to distribute the cranberry puree. Place the pan on a baking sheet and bake in the lower part of the oven for 1 hour. Turn the oven off and leave the cheesecake in for 1 hour longer. Transfer the cake to a rack and let cook to room temperature. Cover and refrigerate overnight before serving. Cream butter, then gradually add sugar and blend until fluffy. Add eggs, one at a time, beating after each addition. Sift together dry ingredients and add to batter alternately with yogurt. Add vanilla. Grease a tube pan and spread a thin layer of batter over the bottom. Stir the cranberry sauce until well mixed; then spread a thin layer of it over the batter. Add another layer of better, and a layer of cranberry sauce, a layer of batter, and end with cranberry sauce. Sprinkle nuts over top. Bake in preheated 375 F oven for 55 minutes, or until a toothpick inserted well into the center comes out clean. Cool in pan on rack for 5 minutes. Remove from pan and drizzle Almond or White Icing over the top. Serves 8 to 10. Combine cranberry juice, water, sugar, cinnamon, cloves, and lemon peel in sauce pan. Bring to a boil, stirring until sugar is disolved. Simmer, uncovered, 15 minutes, strain. Add wine and lemon juice, heat thoroughly, but DO NOT BOIL. Sprinkle nutmeg atop each serving, if desired. 2 tb Horseradish - use more to taste. Mix together and serve with turkey. This a great cranberry addition for Thanksgiving. Combine all ingredients in a small saucepan; cook over low heat, stirring often, until jelly melts. Cool. Yield: 2-1/2 cups. Heat oven to 350 degrees. Grease and flour bottom ONLY of an 8x4 or 9x5 inch loaf pan. In large, combine all ingredients. Stir 50 to 75 strokes by hand until mix moistened. Pour batter into greased and floured pan. Bake at 350 degrees for 55 to 65 minutes or until toothpick inserted in center comes out clean. Cool 15 minutes; remove from pan. Cool completely. Wrap tightly and store in refrigerator. Coat a slow cooker with nonstick vegetable coating spray. Put the stuffing cubes in the cooker and add the water, butter, onion, mushrooms, and cranberries; mix well. Sprinkle the turkey breast with the basil, salt, and pepper. Place the turkey over the stuffing mixture, then place the carrots around the turkey. Cover and cook on the Low setting for 6 to 7 hours. Remove turkey to a cutting board and slice. Place the carrots on a serving platter. Stir the stuffing until thoroughly mixed and allow to sit for 5 minutes. Spoon onto the platter with the carrots and top with the sliced turkey. Boil berries until they pop open. Add pineapple, gelatin and Equal. Chill overnight, covered. Rinse the cranberries very thoroughly. Place them and the water into a saucepan and bring to a boil. When the berries begin to pop add the orange juice. Simmer for about 15 minutes. Place in refrigerator to chill. This can be made well in advance. Drop batter by tablespoonfuls onto a baking sheet coated with cooking spray. Bake at 350� for 10 minutes. Cool 2 minutes on pans. Remove from pans, and cool completely on wire racks.